9.09 points at 114 votes (rank 3). Gamebase64 10 May 2005 - - "A Classic!" A piece of the story! Lucasfilm Games did sense nothing of the ground-breaking success that kept their classic point and click adventures on place 1 of all the charts for years. 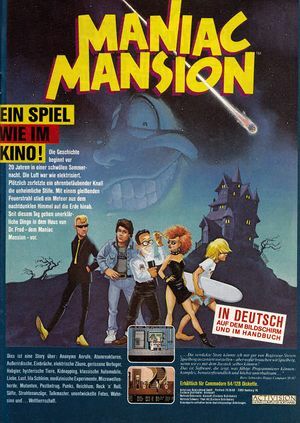 Maniac Mansion was the debut feature (apart from Labyrinth) and flagship of a series of games that were created with the SCUMM engine. Strange people live in Maniac Mansion. Dr. Fred, a "pensioned" family doctor, who became a crazy scientist; sister Edna, a former professional caretaker, whose hobbies would even make a sailor blush; "Weird" Ed, a militant youth with a hamster tic and then there is the dead cousin Ted, and the tentacle, and someone - or rather something - else... And what does the sweet young cheerleader girl named Sandy do in Fred's cellar? Your aim is, to lead a team of three students (including Sandy's boyfriend Dave) through the house to rescue Sandy. During this "trip" you will encounter all the strange residents of the house. And furthermore you will get to know Dr. Fred's secret desire, which he has since the impact of a strange meteor near his villa, that is to control the world. You put together a team of three persons, that you can choose from seven youths. You will notice that each of them has a special skill, talent and weakness. Furthermore, each of the crazy dwellers as aims and wishes, that will help or hinder you, depending on how you treat them. The story and your attempt to rescue Sandy change, depending on what teenager you choose and how you treat the things and people in the house. Each of the possible stories in Maniac Mansion is a very big, complex puzzle, that again consists of smaller puzzles. From time to time movie-like sequences reveal hints about the story or show things, that happen somewhere else. If you discover smaller puzzles that form single threads of the story, you will notice that most of them need to be solved in a certain order. There are always several ways to approach a problem. But there is also always a best way. Rescue Dave's girlfriend from the house of a crazy professor who kidnapped her and holds her captive in the horrible dungeons of the old villa. Don't let yourself get upset by tentacles, meteors, slime and jokes. Maniac Mansion contains a graphic parser that is controlled by joystick and cursor, i.e. here elements of a sentence are clicked and this results in the desired command. At the upper rim of the screen is the message line. Everything that is said in this game, will be shown in this line. Also game related notes are shown e.g. : Put in side 1 of the disk and press fire button. The two underlyind thirds show the surrounding, persons, items and everything that can be interacted with. In the lower third is a series of selectable verbs, with which you build sentences connected with the game world, e.g. "Pick up key" or "Use key in door". At the bottom there is the inventory, the things that you own. In this adventure also "cut sequences" are used. These are short animated scenes - as scenes in a movie - that contain hints and can reveal information about persons. During a cut sequence you cannot interfere in the events. Hence the text below the graphic window is removed. It is interesting, that you can form a team of three persons at the beginning. Dave (Sandy's boyfriend) is always in the team. So you can pick two more teenagers. You can win the game with any team, but the story and some of the puzzles will be different, depending on the combination of the members. Michael is a passionate photographer! Razor is singer in her own punk band "Razor and the Scummettes". Syd is a talented musician who wants to get to the top of the music branch! Wendy is a young author who would give everything to make it big. Sandy is the girlfriend of Dave and was kidnapped by Dr. Fred who wants to get her precious brain. Weird Ed is a militant youth with a hamster tic. Dr. Fred is a pensioned family doctor, since the meteor has impacted near him, he has mutated to a crazy scientist. He holds captive poor Sandy, to scamp around in her brains. Nurse Edna is a former professonial caretaker, whose hobbies would even make a sailor blush. The Tentacle stems from the octopus in David's school and is now the watchdog of Dr. Fred and wants to found an own tentacle band. To switch between the three players choose the word "New kid". The name of the three youths then appears in the line of the sentence. With the cursor click the name of the player, that you want to control. As a shortage you can also use the F-keys. F1 , F3 and F5 are the keys with which the teenager can be chosen. The keys are attributed in the same order, in which the names appear in the screen, when you work with "New kid". What things are in a room, can be found out by clicking the verb "What is" and then moving the cursor over the graphics window. When then name of an object appears, you will know that this is an "active" item, i.e. somewhen in the game it might be useful. To be able to switch off the computer once in a while without having to start the game again later, it is possible to save the game. For this you press the keys Shift + F1 and put a save disk (an empty disk or a disk on which there is already a saved game) into the floppy. The you click onto the option "Save this Game". An existing saved game will be overwritten!! But this option doesn't work during the cut sequences. You can save only one game per save disk. Loading a saved game works the same way. Press the keys Shift + F1 and put a save disk (a disk on which there is already a saved game) into the floppy. Then click on the option "Load a saved Game". Also this option doesn't work during the cut sequences. A cut sequence can be skipped by pressing the key F7 . This function will be very useful, when you have played the game repeatedly and want to leave out the known sequences. To skip the title sequence, also press the key F7 . To pause the game press the Space key. Press it for a second time, to continue the game. The computer will stop the game automatically, when you make no input for five minutes. The cursor cahnges, when the computer accesses the disk or the game was stopped (snail symbol). The speed, with thich the texts appear in the message line, can be changed by pressing the keys + (faster) and - (slower). Read the sign at the fence. Choose "Read" from the verbs and then click on the sign in the graphics window. The sentence "Read sign" forms. Then click on the sign once again (or on the sentence) to execute the command. Dave will then go to the sign and - over the message line - read to you what is written on it. Pay attention to his information. Instruct Dave to go to the house by moving the cursor to the left rim of the screen and clicking once. Let him go further until he is standing in front of the house. Try the sentence "Open door with key" to get into the house. Click the word "Open". The word then appears in the sentence line. Then click on the door by moving the cursor onto the door in the graphics window and clicking on it. In the sentence line now the sentence "Open door with" appears. Go with the cursor to the word "key" in the list below the verbs. Now click the word twice and the sentence will be completed and conducted. What? You don't have a key? Well, where does one usually hide a key? Caution! Spoiler! Freeing the prisoners: Two or more of the team sit in, but you don't have the necessary item - the key - to escape!? No problem! In the dungeon there is a loose stone in the wall. This opens the door when you pull it. The one who releases the secret mechanism cannot run quick enough to the door, as it closes instantly when letting the stone go. But at least he can tide over his friends, if they have been placed in front of the door. Bug: If you have entered a room, where you are in danger of getting caught by a dweller, there is an unconventional way. You have to enter the room and go straight back (after somebody follows you or has talked to you) and then from the corridor directly back again into the room before your follower enters the corridor. It works very well to get nurse Edna out of the kitchen. When reentering the kitchen she will shortly come towards you, but instead of saying "Got you" she will suddenly dematerialize, because according to the time plan of the game she is already in the corridor and walked somewhere else after that. Jodigi: "Lucasfilm created a really exciting, enthralling and interactive adventure at that time, with which I had fun over scores of game rounds. And the one who cannot get enough can try it with the different combinations of characters (each with its advantages and disadvantages). Maniac Mansion is sort of one of the first interactive movies." 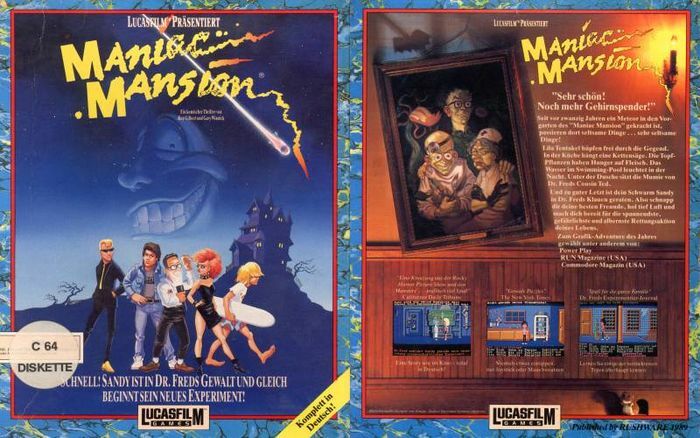 Jammet: "Maniac Mansion is one of my favourite games by Lucasfilm. Unfortunately, there are only two of them for the C64, and Zak McKracken is even a hint better. The puzzles are constantly solvable. In contrast to the Lucasfilm games that are common today, there are situations in Maniac Mansion which make advancing impossible. However, you need to work hard to get that far. Furthermore you can isntantly see it, wenn you have lost your way. Maniac Mansion can be recommended without limitation to those, who cannot get enough of funny, crazy professors and cranky humor." Guybrush: "The starting shot for one of the best game genre that exists, the grafic adventure. A trend-setting master piece in the history of games, which really would deserve 11 out 10 points!" Andy027: "This game was the basis for further successfull blasts by LucasGames! Guarantees long fun, great puzzles and above all, the addiction to more LucasGames. The best thing in Maniac Mansion: the exploding hamster! In Zak McKracken can the microwave oven only be misused for a raw egg..."
TheKills: "A piece of gold! The SCUMM application was a bit slow, but it is unbelievably ingenious. It is ground-breaking what has been anticipated here for the games in the 90s (graphic adventures). I loved it and I still love it today. I thought the diversity of the solution methods more interesting, even though Zak McKracken takes longer. mombasajoe: "A new definition of the adventure genre and a milestone of the software history. If the game had pardoned some more mistakes, I would have given a 10. But due to some frustration (game is not solvable after certain actions) I give "only" very good 9 points." Snake Slobodan: "I played this game for days, weeks and months. Great conversion, funny ideas and good music - a real classic. Still today I like playing it now and then on the emulator. And therefore it also gets from me deservedly the highest points of 10." No matter for which solution method you will decide - what could you do with a chain saw, for which there is not a drop of petrol in the whole adventure? Around this puzzle entwine myths. The "answer" to this can not be found until Zak McKracken on the mars. But only in the first fan project Zak McKracken II (only for PC) is it possible to fuel it - accompanied by applause and shouts of joy. The spiral stairs in the library and the "Out of order" sign at the stairs: this comes from the Skywalker Ranch, the place where the group around Ron Gilbert programmed the game (the stair really existed there). Against all rumors, it is only a misguidance and has no function. (This does not work in all conversions, on the NES you can in return drown the hamster in the toilet - also not much better...). The hamster-in-the-microwave was also "warmed up" in the follower "The Day of the Tentacle" - in the truest sense of the word. If one turns the telescope into the wrong direction, you see a raging monster. It stems from the earlier Lucasfilm game Rescue on Fractalus and made for some adrenaline pushs in the players by turning up surprisingly. If you fall into one of the following traps, the game will get insolvable, therefore it is wise to save before you reach the critical points. If you want to enter the house by the front door with the first character and ring the bell before opening the door you get into prison and Ed closes the door again. Then the character with the key sits in prison and the other two cannot enter the house without the key. If you pour the paint remover into the bowl in the dark roomor given it to the man-eating plant, you can't go on either, as you cannot make the door visible. If one of the character dies, but has important items with him, these are gone. For a change you should hand all items from Dave to someone else shortly before the ending and then let Dave die and solve the game with another kid. Then there is a different end sequence. With all endings except the one with the TV studio, Fred will say that he wants to build a machine to revive Dave. If you e.g. play with Dave, Jeff and Razor and you forget to watch for the packet you will not be able to get the stamps. The second solution with the meteor police doesn't work either, as none of the persons knows how to use the radio. The only solution with Razor and Jeff is the record deal for green tentacle, but without a stamp this doesn't work. Ed kills the perons, which hands him his grilled hamster. You should only hand the record contract over to green tentacle if you really have sent in HIS demo tape. If you sent in one by Syd or Razor and this person then hands over the contract to green, he will be so jealous that he will kill Syd/Razor. If you choose characters with which you need to solve the game with the help of the envelope from the safe (Sid or Razor/record contract, Wendy/script), you need to take care that you are correct when handling the Man-eating Plant. I.e. you need to use the plant (not the pot!) with the radioactive water first, then with Pepsi. Further possibilities to die: You can put radioactive water into the microwave and evaporate it, the water can be fetched from the swimming pool. You can also drain the pool from the water and put a person in it and refill it - glugg glugg! Ah yes, and to overwrite the tentacle mating call on a cassette and then put this cassette into the cassette player of the green tentacle, is also a very creative way to extinguish a screen life. Since 2009 there is a GOLD version of Maniac Mansion by Onslaught for the owners of an at least 512k-sized memory extension of the type NeoRAM or GeoRAM. With this version you can enjoy the game without long loading times. Since 22nd November 2010 there is a Maniac Mansion Mercury version by Onslaught for the owners of the EasyFlash cartridge. Added mouse support (port 2), verbs are placed on the right mouse button. Two scores are saveable directly into the flash memory (without limitation of the writing cycles). Manual, room viewer, map of the house, title screen, game poster, tribute intro, "Hidden Parts". Should also run on NTSC machines (with exception for music in the eagle intro). In this game there are no points or a highscore. With the Easyflash version of MM & ZMK the time used to complete the game (also in savegames) is recorded and can be viewed by pressing T in the savegame menu. This page was last modified on 11 September 2016, at 16:05.